Never underestimate the power of proper lighting, organized shelving and a brand new mattress. Learn how to improve these aspects of your home and create a more enjoyable living space. In the world of home ownership, some things are easier to deal with than others. Here we present three potential problems that require a little more thought but make a tremendous impact when they’re resolved properly. A good lighting plan and a good storage plan go a long way toward making life in your home more attractive, enjoyable and stress-free. But if you don’t sleep well at night, nothing else seems to matter. If your mattress is worn out but you dread facing the gauntlet of shopping for a new one, we offer some pointers on making the task easier. Problem: Inadequate and/or uneven lighting inside and outside the home. Lighting a home well involves more than plugging in a few lamps. A successful outcome requires intentional forethought. There are many more lighting options today than most people realize, says Andy Benson, president of Benson Stone Company, 1100 11th St., Rockford. Benson employs staff members who know what all the options are in lighting and how to solve problem areas. You’ll find thousands of lights in the 4,000 square-foot lighting gallery at Benson Stone, and thousands more can be ordered. Thick catalogs of many lighting brands are piled throughout the showroom and staff members can help you pore through them to find what you want. Benson Stone’s complete line of lights is available on its website and searches can be narrowed to particular rooms. “You can look across at all brands and compare similar fixtures and know it’s an apple-to-apple comparison with a similar quality level compared to big-box stores,” Benson says. Outdoor lighting and landscape lighting also are available in the lighting gallery, which is convenient for those who are planning landscape upgrades over in Benson’s landscape and stone department. People who consciously decide to upgrade the lighting in their homes are often amazed at how much better everything looks, says Michael McGinty, manager of the lighting gallery. McGinty believes lighting should be versatile enough to accommodate the moment. Whereas big box stores “provide basic light cheaply,” Benson Stone Company provides a world of options at all price points, says McGinty. The gallery displays chandeliers, pendant lights, wall sconces, floor and table lamps, outdoor fixtures, landscape lighting and much more. The selection includes everything from entry-level lighting to high-end products. Benson’s goal is to provide a range of lighting products and styles at various price points. In terms of style, crystal is making a big comeback. That’s not the only trend. The urban-warehouse style, for a more industrial or “Edison” look, is popular now, too. The Problem: No organized way to store items and too much messy clutter. Sometimes this means taking a hard look at our possessions and being honest about whether each one merits the space it takes up. Other times this means accommodating our habits with well-designed, easy-to-use storage solutions. The options were pretty limited. “When I started in this business in 1985, most everything was shelf-and-pole construction and closet design wasn’t talked about much. That has changed,” says the owner of Shelving & Bath Unlimited, 4337 S. Perryville Road, Cherry Valley, Ill. 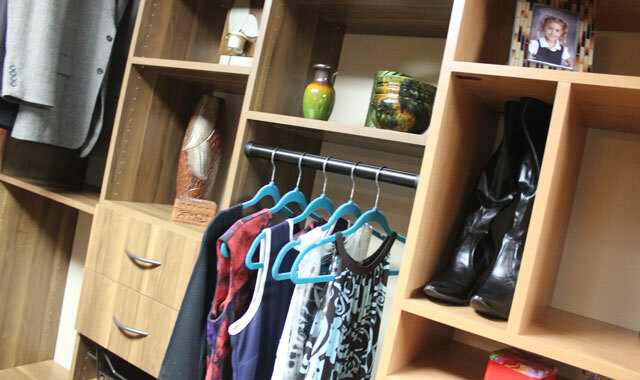 Custom laminate closet systems look like finished wood cabinets. Weller carries more than 50 color and finish options; there are options for granite surfaces, motion-activated LED lighting (even lighting inside drawers if you want it), built-in mirrors, jewelry trays, slide-out removable laundry bags, a fold-out ironing board, mirrors, and adjustable cubbies for shoes, boots and handbags. There’s also a slide-out valet rod for hanging tomorrow’s outfit. Many people in our region love the vintage character of their older homes but loathe their tiny closets. While some people go so far as to convert spare bedrooms into luxurious walk-in closets, sometimes even incorporating laundry equipment, others double or triple the efficiency of their reach-in closets by having them professionally designed. Either way, it’s the design expertise offered by Shelving Unlimited that makes it possible to meet organizational goals. It’s not just a matter of buying the materials and installing them yourself, either, he says. A professional closet designer sees possibilities and finds solutions that the average person wouldn’t. “You can buy materials at box stores, but you’ll pay a premium for the materials and have no professional expertise in the design,” says Weller. He takes the time to ask many questions about how the space will be used. For example, most women wear fewer dresses than separates, these days, so it often makes sense to convert full-length hanging space to improve its functionality. Weller also designs storage solutions for the pantry, garage, laundry room, home office and basement. Along with adjustable-shelf laminate storage, Shelving Unlimited offers wire shelving systems by Rubbermaid, the No. 1 brand in the industry. Weller has carried the Rubbermaid brand for 30 years “because it’s the best.” Wire shelving is often the material of choice for a pantry and there are options. “Tight mesh,” for example, is good at preventing smaller objects from slipping through the spaces between wires. A reach-in pantry is typically 2 to 3 feet wide and 16 to 22 inches deep. It’s important to install adjustable shelves staggered at different heights to give customers the ability to change their space as needs evolve. Weller recently had a customer who wanted her pantry to accommodate wine bottles and a mini refrigerator. “We had to get creative and go online to find the right size unit, but we did it. It holds six cold bottles of wine at a time. We also added wine racks for more wine storage. Garages can quickly spiral out of control if storage isn’t carefully considered. When a customer calls Shelving Unlimited, Weller typically makes a home visit to measure spaces and observe the placement of air vents, light switches, ceiling fixtures, electrical outlets and the direction that doors swing. He takes customers through a series of questions about how the space will be used. Next, Weller custom designs a plan and presents options, then installs the new storage system down to the smallest detail. Customers can browse the showroom to see examples of materials and options. The Problem: My mattress no longer suits me but I dread the process of selecting a new one. Few things are as important as consistently getting a good night of sleep, and this requires a good mattress that’s well matched to your particular needs. Too many Americans are sleep-deprived, getting 90 minutes less sleep, on average, than we did in the 1960s and 1970s, says Dale Gustafson, owner of Gustafson’s Furniture & Mattress on East Riverside Boulevard and East State Street in Rockford. There’s never before been a wider selection of mattresses, which can make the buying process pretty confusing. Foam and gel technology are popular, as are combinations of coil, gel and foam. “The best mattress for you is the one that feels the best to you. You know your body better than anyone else,” says Gustafson. “Spend enough time laying on a mattress to make a good decision even if it takes two hours. In the final analysis, it should be your decision, not the salesperson’s. Additionally, separate the comfort decision from the price decision. Think about what feels best. If you divide the nights of use into the price, “you’ll find the nightly cost to be less than a cup of latte,” says Gustafson. “Buy the best you can afford and buy for comfort, not durability,” advises Mitchell Johnson, store manager at the 6651 E. State St. location of Gustafson’s Furniture and Mattress. Like Gustafson, Johnson has matched up thousands of customers with thousands of mattresses through the years. The process of buying a mattress is less confusing when you shop at a store where salespeople really know mattresses and are adept at making good matches with customers. While mattresses are offered in a wide range of price points, many people find that the mattress that suits them best is not necessarily the most expensive one, says Johnson. “You determine the price range and comfort level and we’ll help you find the most comfortable mattress for you in that range,” he says. “What was a $2,000 mattress a few years ago may now be a $700 mattress today,” as the latest mattress technology continues to evolve. At present, the most popular mattress categories are coils-with-foam and all-foam mattresses, the latter having been introduced about 20 years ago by Tempur-pedic. “There are many kinds of gel mattresses now, too,” says Mitchell. The average mattress price is $1200, although Serta has models that sell for up to $3,000 for a queen size. Along with choosing a good mattress, consider the platform beneath it. Adjustable platform beds are trending among all ages. “Millennials like to sit up in bed and work on laptops etc. and older people have always valued adjustable beds,” Johnson notes. When couples aren’t likely to agree on the position the bed should be adjusted to, there’s a solution. To make mattress shopping easier, Gustafson’s plans to introduce Dr. Scholl’s sleep preference technology later this year. This is a specially equipped bed that a customer lays on for about 7 minutes. Because of his extensive background in mattress sales, Johnson was asked by Serta company to help design this new tool. While you still have to spend a lot of time testing out various mattresses, “This will help to simplify the mattress shopping experience for a customer,” Johnson says. “It can be overwhelming to walk in and see so many mattresses – they all look square and white, so what’s the difference among them? This entry was posted on Wednesday, June 29th, 2016 at 12:00 pm	and is filed under Home & Garden, Top Posts. You can follow any responses to this entry through the RSS 2.0 feed. Both comments and pings are currently closed.